Members of the BIA of the Greater Valley can access exclusive discounts through National Purchasing Partners (NPP). Take advantage of special pricing on popular products and services for business and life. You can also share select offers with your employees. NPP membership is FREE and there is no obligation to buy. Join today to find exclusive pricing from Office Depot, Best Buy, Sherwin Williams and, if eligible, Verizon. As a national savings and solution provider, NPP researches member needs, discovers new technologies and negotiates impressive savings on a variety of useful products. 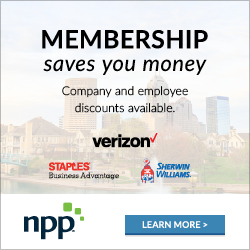 To learn more about the discounts that are available to your firm and employees, register for free with NPP. Once you register with NPP, you will receive an email request to set your password. Simply set your password, login and explore our catalog of offers. If you need help registering, please contact customerservice@mynpp.com or call 800.810.3909.